Enjoy the great architecture along with pleasant live music with us! The best way to understand the great architecture or significant places is to actually visit and experience the space. Our event will provide you with such opportunity, particularly with the aid of live music. Called TOSHIGAKUSHI [Urban musicians] existed in the Medieval Europe, who enhanced the urban life with music and performance. We are introducing the contemporary version of TOSHIGAKUSHI in Japan. There are several masterpieces of early Western Style buildings of the Meiji Era in Nihonbasi area such as Mitsui Main BLDG. and Mitsukoshi Department Store. The section of Edo-Sakura Street between Mitsui Main BLDG. 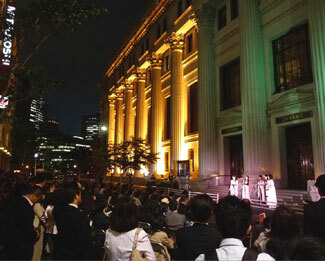 and Mitsukoshi Department Store will be the venue for the event, and we want to share the pleasant collaboration of architecture and music with you. Last year, we hosted 2,000 people at this event. This is also an opening event of the open! architecture, 3-week open house event, which will showcase the architecture that represents the history and culture. TOSHIGAKUSHI of this year will include Aura, female a cappella group, and Nobuko Kawashima, who plays the Satsuma Biwa, Japanese lute. Come join us to celebrate the wonderful moment of great architecture and music! *Please note that any changes artist by condition. *Please note that any changes venue by rain.